Jackson Schwartz deals in heat. 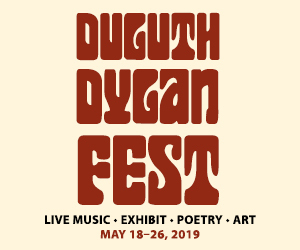 His craft is defined in various bursts of Fahrenheit—taking some of the most basic materials on Earth and transforming them with the careful application of fire. 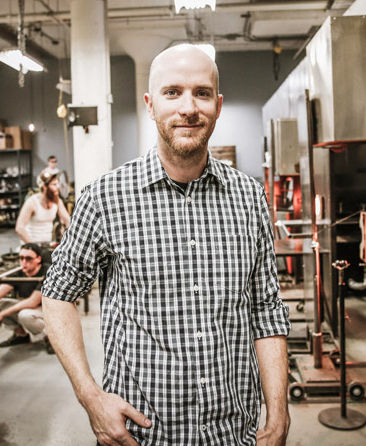 His work, in turn, helps illuminate some of the trendiest gathering spots in town. 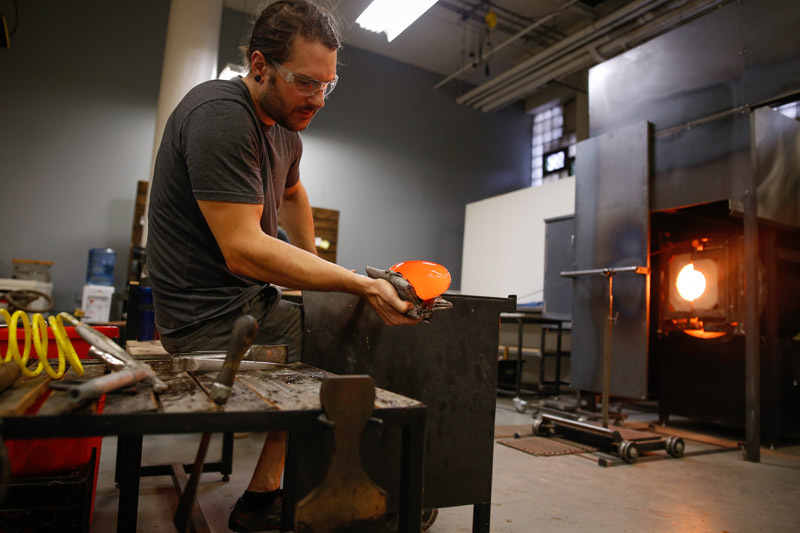 Schwartz’s Hennepin Avenue glassmaking studio, Hennepin Made, looks equal parts modern and medieval. 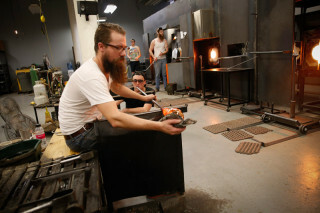 Furnaces and heaters loom over the space, casting an occasional glow of volcanic orange on a row of workbenches surrounded by soot-black tools. The basement room is hot, with no windows to give a hint of the chilly November happening outside. 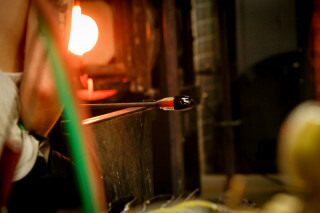 A team of tank-topped craftsmen completes the illusion as they sweat over glowing orbs of red-hot glass. 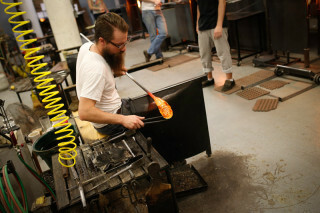 Schwartz was teaching in the glass program at the University of Wisconsin–River Falls when he met his future business partner, Joe Limpert. A ceramicist at the time, Limpert eventually became fascinated with the glassmaking craft. The two worked together for a few years, blowing decorative pieces to sell at art fairs, but they were increasingly approached by architects and designers looking for artisan lightning. They knew that this—a collection of lighting designs—was the path to make their passion a viable business. They custom fabricated their own studio and held sales of small items—drinkware, vases, bowls—to stay afloat for the first year. 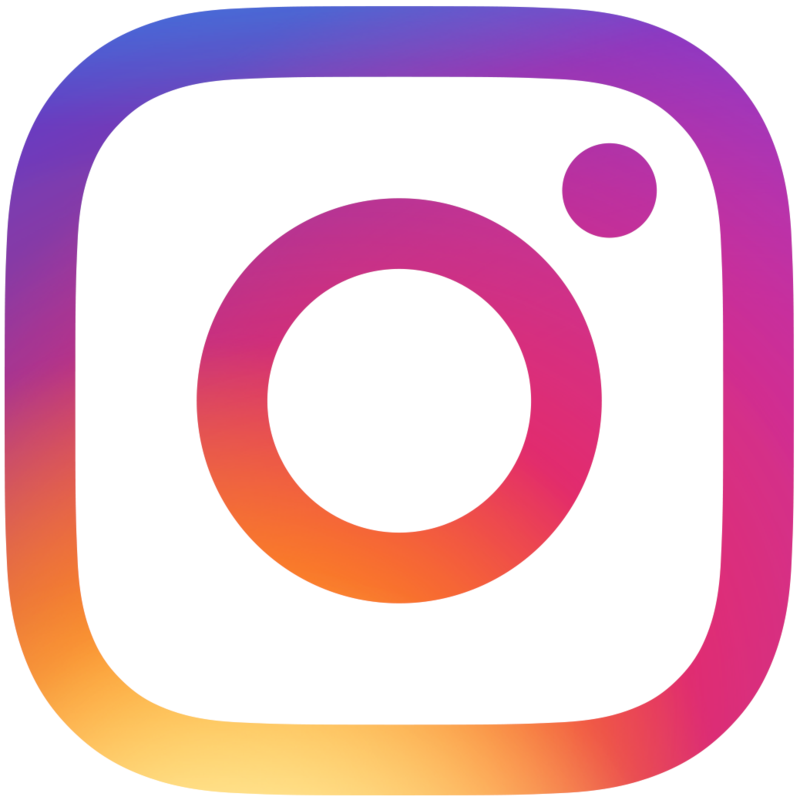 They also spent that time refining their lighting designs and connecting with their now-primary client, furniture retailer Room & Board. Developing a collection with them has allowed Hennepin Made to grow from a two-man operation to a multi-team design studio with eight full-time employees. Their lighting can be seen around town in such restaurants as Spoon & Stable and Tilia. 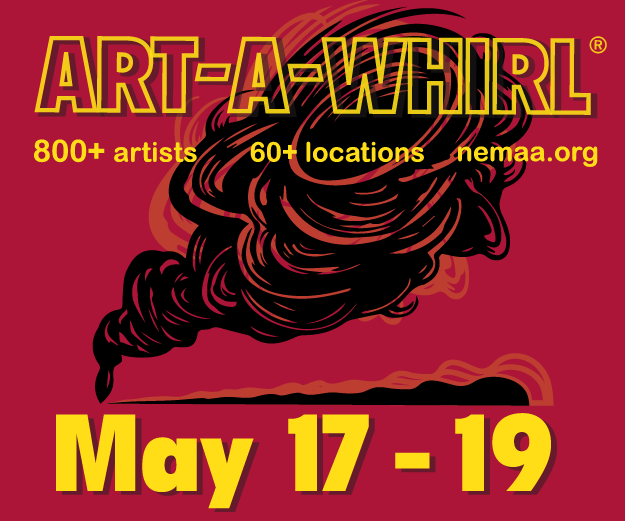 Each Hennepin Made artisan light begins as a random swirl in a cauldron of magma. 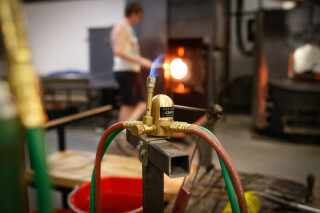 The studio’s electric furnace holds 400 pounds of molten glass, mostly silica, with some other minerals and oxides that lower its melting point. 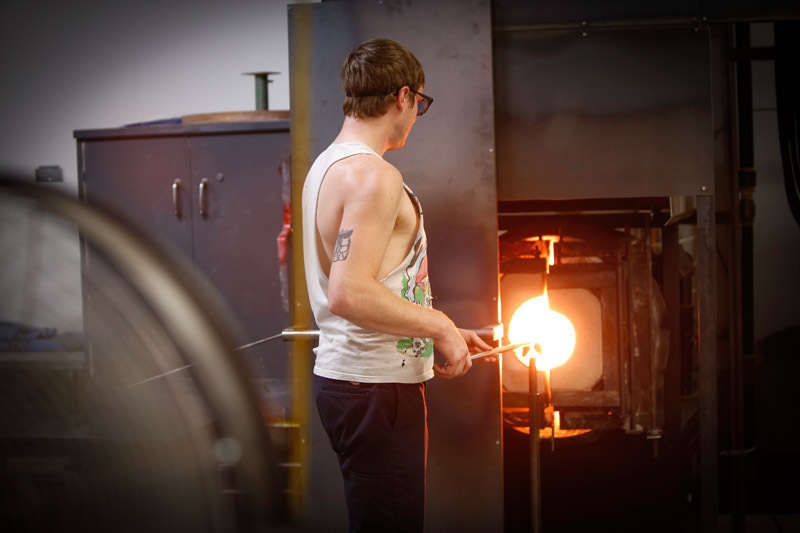 The furnace boils glass 24/7 at 2,000 degrees Fahrenheit. The raw materials take about eight hours to cook down, all the while belching out the gasses produced by the melting process. If an air bubble manages to reach the blowing pipe, it’s drawn out of the red-hot balloon with giant tweezers and snipped off with shears. 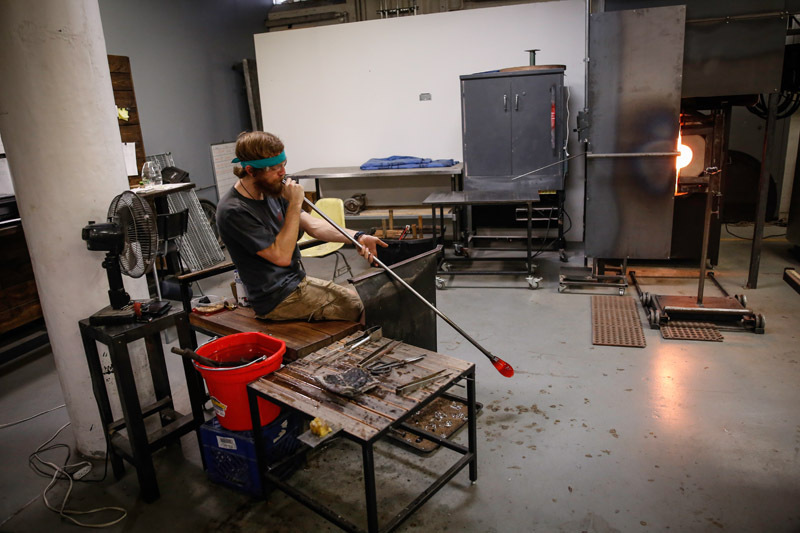 Each blown piece starts with a single “gather”—a furious orange glob of glass dipped onto the end of a stainless steel pipe. The first glassmaker of the three-person team, appropriately dubbed the bubble starter, takes that gather to a bench fitted with steel beams on either side that act as stops. 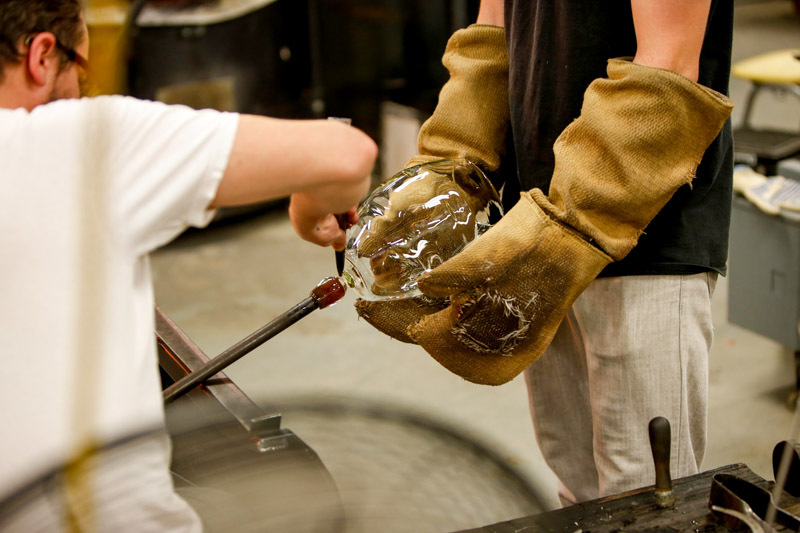 Rolling the pipe slowly back and forth between the beams, it becomes clear that the glassmaker’s most important tool is gravity. 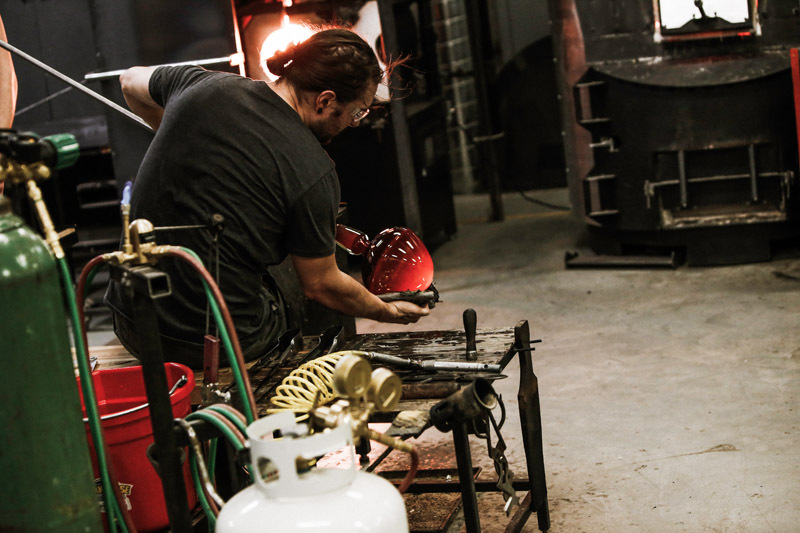 As he angles and rolls the hot, sagging glass, the fiery blob begins to take on a consistent shape—the first step of many on its journey to becoming a piece of art. What comes next takes no small amount of finesse. After blowing a tiny breath into the pipe, the bubble starter traps the warm air with his thumb and forces a bubble to emerge inside the gather. He then begins to mold and grow that interior bubble ever so slightly, making sure its walls remain thick and consistent enough to hold another gather of glass on top. The larger the intended piece, the more gathers that are needed—one for a drinking glass, two for most lights and small bowls, conceivably up to six for the largest, most intricate designs. 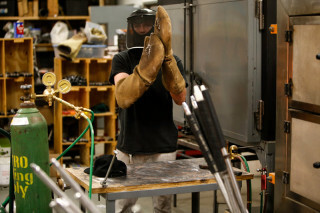 For such an industrial-looking process, the studio is awfully quiet—almost contemplative. The low hum of the furnace serves as white noise and is studded only by the occasional whoosh of warm air from an opened kiln, whistle from a nozzle of compressed air, or burst of steam from a hot pipe hitting a cold bucket of water. 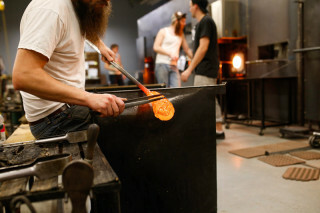 Six glassmakers huddle over glowing orbs, passing pipes and glass between them like an artisan assembly line. Once a bubble is complete, it’s handed off to the other two members of the team: the gaffer and the assistant. Together, they blow more air into the pipe and expand the small bubble like a balloon—blowing, shaping, heating, and pinching the growing bubble into their desired shape. Their tools are rudimentary—calipers and tweezers, wooden paddles, even paper. “One of our main shaping tools is actually wet newspaper,” Schwartz says. “It’s just a pad of newspaper that we fold up and soak for a couple hours in water. 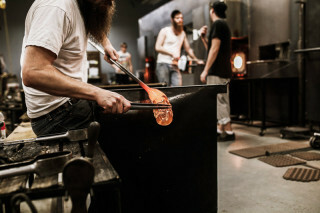 We burn the first layer of it, which creates this burnt carbon layer, and as long as we keep that layer wet, it won’t stick to the glass.” Cradled in the newspaper, the glass sizzles, each roll smoothing its searing surface. 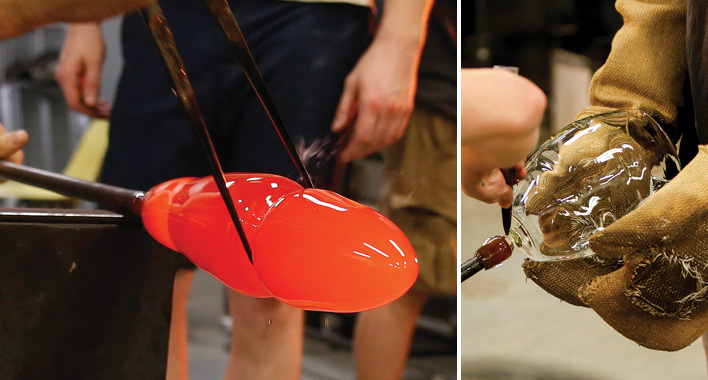 Once a piece has achieved the right volume and contour, it’s time for the Transfer, when a new pipe, called a punty, is introduced to the process. The punty has a dab of hot glass at one end that attaches to the bottom of the piece. 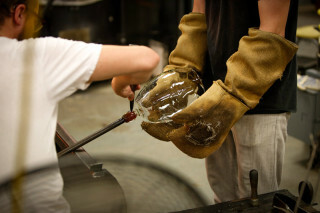 Once secure, the glassmaker gently breaks the piece off the original blowing pipe, exposing an opening in the glass that’s about an inch wide. Using heat, the hole is widened to about four to six inches—wide enough to reach your hand in to change a bulb. Nearing the end of its journey, the piece is then detached from the punty and stashed in a kiln set to 900 degrees Fahrenheit. Once it’s reached capacity, over the course of a day or so, the heat is slowly reduced inside the kiln. When the glass cools to room temperature, stone-working tools are used to grind, sand, and polish the near-complete lights. Finally, holes are drilled for the socket, leaving just packing and shipping to go. 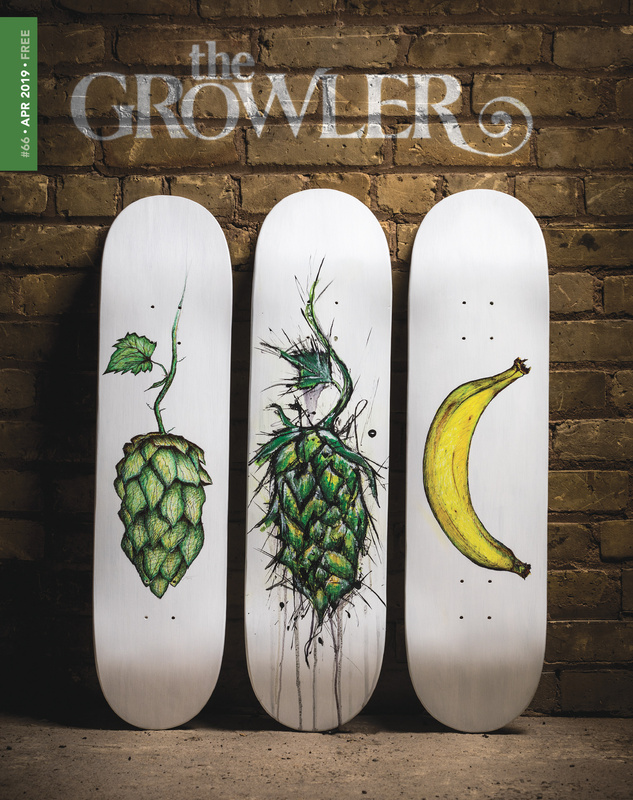 Over time, Hennepin Made hopes to open a retail store, which would allow them to introduce accessory items like drinkware and other more gift-worthy designs to their catalogue. For now, though, they’re focused on growing their business by perfecting a clean, simple mid-century aesthetic with their lighting.